"Believing," "Believing That," and "Believing In"
Matthew 24:23 - Then if anyone says to you, 'Look! Here is the Messiah!' or 'There he is!' -- do not believe it. James 2:19 - You believe that God is one; you do well. Even the demons believe-- and shudder. Those are three often quoted Bible verses, the first giving an example of “believing” something heard or read, the second an example of “believing that” something is true, and the third an example of “believing in” some thing or some person. The little three letter Greek word translated “in” is important in John 3:16 and can also be translated “into.” Trying to understand the Greek is complicated by the fact that the word translated “believe” can also be translated as “believe in” or “have faith.” So, putting those two Greek words together can be translated as "have faith in," or “believe in in” for double emphasis implying a serious, life-changing, kind of belief. The reason I thought of commenting on the subject of belief is the frequency with which people are accused of not “believing in” global warming or of not “believing in” evolution. Use of that language supports speculation that those two topics, global warming and evolution, have become twenty first century matters of faith, or perhaps even religions. Well, let me make it clear that I do not "believe in" global warming, nor do I "believe in" evolution. I also want to affirm that I “believe that” evolutionary processes are an important part of God’s creation even though they really have not been proven conclusively to result in new species and offer no explanation for why there is anything to evolve. I see no reasonable way to refute the evidence of their existence, nor do I see any good reason to try to do so. I just don’t “believe in” evolution to the extent that I let it guide my daily living and set my priorities or even suggest atheism. There is really nothing I can do about it anyway. I understand that evolution is a very slow process, and I have not been trained in any genetic modification techniques. Turning to religion, with respect to personal faith in something around which I can try to organize my life, I can use “believe” in all three ways. I “believe” the Catholic Catechism statement on Sacred Scripture: “All Sacred Scripture is but one book, and this one book is Christ, ‘because all divine Scripture speaks of Christ, and all divine Scripture is fulfilled in Christ.’” Well, of course such believing is a matter of Christian faith, and we really can’t expect people of other faith traditions or of no faith to buy it. I “believe that” Jesus was the only Son of God, eternally begotten of the Father, God from God, Light from Light, true God from true God, begotten, not made, con-substantial with the Father, that through Him all things were made, that for us and for our salvation, he came down from heaven, that by the power of the Holy Spirit he was born of the Virgin Mary, and became man, that for our sake he was crucified under Pontius Pilate; that he suffered, died, and was buried. That on the third day he rose again in fulfillment of the Scriptures; that he ascended into heaven and is seated at the right hand of the Father. That He will come again in glory to judge the living and the dead, and that his kingdom will have no end. (That is all from the Nicene Creed.) And, here again it is a matter of faith which Christians tend to view as a gift and not a personal accomplishment. It is not something to generate pride, but rather something to motivate thanksgiving and action. But neither “believing” nor “believing that” approaches what Jesus really asks of us. It is only “believing in” Him, as in John 3:16 quoted above, that approaches the ideal. And that means having a desire, even if we fail, to organize our lives based on what we have been told and what we have learned about Him and what we have come to believe about Him. It might be like a "believer in" global warming adopting a cold shower, open window, bicycle only approach to life, which wouldn't be all bad. It might be like a "believer in" evolution dedicating his or her life to trying to persuade others of the truth of it and the absence of any creator, which would be all bad. Objectively, “believing in” Jesus, means, at the very least, being baptized and a part of His Body, the Church, which He founded and left to do his work, obey his commandments, and follow his example. It is through His Church that we achieve unity with Him. 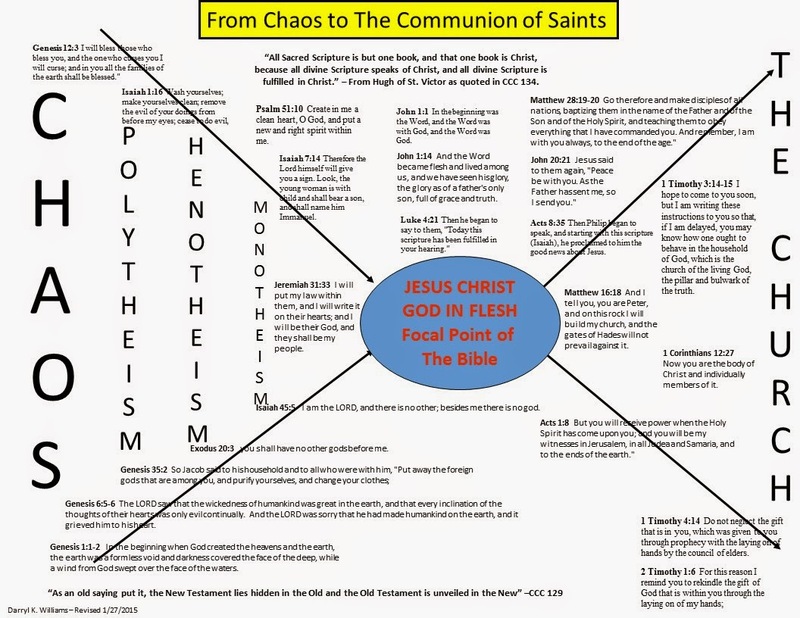 Subjectively, however, the interesting and often confusing thing is that understandings and expressions of that unity by the millions of Christians around the globe vary as much as the differences in their personalities, dispositions, educations, understandings, cultures, environments, spiritual maturities, and personal histories. And that is a lot of variability, and a very good thing, creating many opportunities for us to help each other along. So, don’t be looking for “cookie cutter” Christians as you travel the globe, or even as you look around the community in which you reside. 1 Corinthians 12:27 - Now you are the body of Christ and individually members of it. Colossians 1:15-19 - He is the image of the invisible God, the firstborn of all creation; for in him all things in heaven and on earth were created, things visible and invisible, whether thrones or dominions or rulers or powers-- all things have been created through him and for him. He himself is before all things, and in him all things hold together. He is the head of the body, the church; he is the beginning, the firstborn from the dead, so that he might come to have first place in everything. For in him all the fullness of God was pleased to dwell, and through him God was pleased to reconcile to himself all things, whether on earth or in heaven, by making peace through the blood of his cross. Encouragement of designated giving can be an effective fundraising tool but, except in the case of major capital campaigns for specific projects, has little or no effect on programs of non-profits using the method to raise money. I am reminded of the confession of a police department that, although their fund raising campaign was focused on bullet proof vests for officers, they were going to buy the same number of bullet proof vests regardless of the fund raising result. It was just that bullet proof vests support an effective emotional appeal for money. As a young adult, I was a member of a Southern Baptist Church that taught tithing and essentially forbade designated giving, unless pre-approved by the Board of Deacons, because it was seen as a way for church members to vote with their money and personally impact church priorities, a clear responsibility of the Board of Deacons. It was also a nuisance for the church treasurer to keep up with the various designated funds and make sure they went to the right place. About that same time, the local Community Chest was raising a million dollars or so each year to fund locally popular non-profits serving the community. Over the next couple of decades, the Community Chest gave way to United Way, and some of the agencies being funded under the new regime were extremely unpopular with some of the donors pressured to give to the annual drive. To assuage their concerns, donors were allowed to designate their gifts to one or more agencies and leave the others out. It made no difference of course in the distribution of the funds except in the very rare case that designations to a particular agency exceeded the budgeted amount for that agency. I doubt that ever happened. And money of course is fungible, making it impossible for a designator to track his or her hundred dollars and make sure it went to the Boy Scouts or whatever other agency he or she might have designated and not to some organization with goals perceived by him or her as suspicious. Loss leaders of course are those products sold in groceries and other retail outlets at a "loss," less than their fully allocated cost of acquisition, selling, and distribution, because they are known to increase store traffic and total sales revenue and thus result in greater profits even if showing losses as individual items. It has been a long standing tradition, for example, for groceries to feature Coca Cola products one week as loss leaders and Pepsi Cola the next. (Both soft drink companies were rumored to require the stores to feature their products at least fifty percent of the time if they were to have the privilege of selling them at all, and that was judged by smaller soft drink companies as a grossly unfair trade practice.) The point is that revenue is revenue and always contributes to the bottom line profits whether the particular product generating the revenue, based on the accounting system in place, shows a profit or not. Whether the $500M in federal funding going to Planned Parenthood is designated for services other than abortions is absolutely immaterial because money is fungible and enables the organization to grow and increase impact on society while directing whatever other income it has to expansion of abortion services. So long as the books show spending on services other than abortion is equal to or greater than the federal funding, the organization can claim that none of the federal $500M went to abortion services. Accounting is a wonderful art. Whether the collection of revenue from transfer of fetal tissue, in the form of body parts, shows a profit based on the accounting system in place is absolutely immaterial. The claims of Planned Parenthood that they are only offsetting cost with the revenue collected would be like Publix Supermarkets claiming that it is not profitable for them to sell soft drinks as loss leaders. It obviously is profitable or they would not do it. So, here is my recommendation for Planned Parenthood. Spin off whichever is the smaller of the two major parts of the organization, Abortion Services or Women's Health, and then let the Federal Government contract with the Women's Health part to provide Women's Health Services on a cost plus basis just as they pay through Medicare for elderly health services. If funds were to be transferred from the Women’s Health entity to the Abortion Services entity, that would be very difficult to hide with accounting manipulations. Then the Abortion Services part of the organization could look elsewhere than the US Congress for funding. I suspect there will be plenty of it, probably largely from organizations much more interested in preventing births than in Women's Health. PP Abortion Services might even become the larger of the two. And, to Congress, until Planned Parenthood engineers that divorce, there should be no federal funding of it. 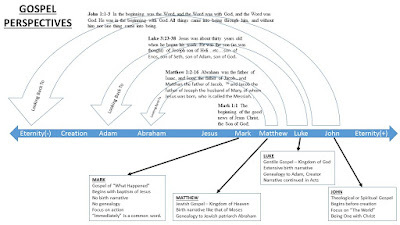 There are lots of interesting differences among the four Gospels. Here is an interesting one to contemplate. Click on the image for a readable version. By clamoring for financial concessions and support (from federal, state, and local governments), thereby transferring our responsibilities to others, we people of faith have slowly given up freedom of religion in the United States of America. It started innocently enough when we were overwhelmingly, at least nominally, Christian and when we almost all agreed that Churches were important to the general welfare and the common good and that every marriage of a man and a woman resulting in children who would be raised and cared for by a full time mom and a wage-earning, grocery-buying, mortgage-paying dad was a key building block of our society. We all pitched in to make those things happen by granting financial concessions to churches and their pastors with tax exemptions, housing allowances, etc., to married couples by allowing them to pay lower taxes with joint tax returns and lots of exemptions, and to all citizens by letting those who wished to do so take tax deductions for gifts to their churches. The so-called establishment clause in the US Constitution, "Congress shall make no law respecting an establishment of religion, or prohibiting the free exercise thereof..." was not violated, but Congress made many laws encouraging the establishment of religion and rewarding the free exercise thereof. And that worked fairly well so long as we were overwhelmingly religious and Christian and of pretty much one mind about what was good for the USA. And the unfairness inherent in the facts that singles, couples without children, and folks who didn’t give money to their churches had to pay higher taxes to make up for the rest of us was not a major problem. Even Christian charities, hospitals especially, began to clamor for government grants and government insurance payments, all of which came with strings attached, some of those strings requiring that some Christians deny or abandon core beliefs or lose funding. So, here is my suggestion. Let’s render unto Caesar what is Caesar’s and unto God what is God’s and pay our own way without asking others to shoulder the burden for us. Let’s pay property taxes on our property and fair and flat income taxes on our incomes. Let’s fund our own charities with no government involvement. Let’s eliminate financial motivation for following the commandments of Christ and leave only the Holy Spirit as the prime mover. By so doing, we can begin to regain the freedom of religion that we have lost. I believe such a change would lead to bigger and more powerful Churches taking up space in the world, proclaiming freely the Gospel, speaking freely on public issues, paying their fair share for government provided services, asking for nothing and giving everything, inspiring and attracting believers, and a lot fewer storefront churches doing little other than paying utility bills, making mortgage payments, and supporting founding pastors and their families. We would have true separation of Church and State, most IRS employees would take early retirement, politicians would quit spending their time granting concessions for votes, freedom and faith would take giant steps forward, and the clamoring would cease. A new biography, Richard John Neuhaus: A Life in the Public Square by Randy Boyagoda, does quadruple duty. It provides a well-researched and documented critical look at the life and work of Neuhaus, in the context of US history, including sociological trends, from the 1960’s through the early 2000’s, societal pressures on and changes in the role of the Church, or religion in general, in public life, and the continuing struggle over unresolved Reformation issues among and within Catholic and Protestant bodies. It is a great read. Neuhaus (1936-2009) was raised the son of a Missouri Synod Lutheran pastor in Canada, received the Master of Divinity from Concordia Seminary in St. Louis, and served as pastor of Brooklyn’s low income, mostly minority, St. John the Evangelist Lutheran Church in the 1960’s. He preached and spoke in favor of social justice and civil rights and against the Vietnam War, and became well known as a liberal activist. As his liberal friends and associates moved leftward and more secular in the 1970’s, Neuhaus moved right and became a strong spokesman for conservative Judeo-Christian ethics and positions on public issues. One of a diminishing minority of Lutherans who saw Lutheranism as a reform movement within the universal Catholic Church, Neuhaus gave up on Lutheran reform, was received into the Catholic Church in September, 1990, and was ordained a Catholic Priest a year later. Included in the biography are his eloquent explanations of the reasons for this change and for his shift to conservatism. A prolific and powerful writer, Neuhaus is perhaps best known for The Naked Public Square: Religion and Democracy in America, published in the mid 1980’s, and comprising a direct challenge to the emerging Political Correctness movement. Neuhaus later assured his own access to the Public Square through founding of First Things: America’s Most Influential Journal of Religion and Public Life. The journal achieved a paid circulation of more than 30,000 and has continued after his passing. The image of Neuhaus based on the biography and on his quotes therein is of a bigger-than-life, somewhat rude, impatient, and outspoken man who loved bourbon and cigars and didn't hesitate to consume even the cigars in a friend’s living room. However, watching him speak on one of the many YouTube videos available (example), he comes across as a loving pastor serving God and neighbor. Well, I suppose that too is a bigger-than-life image. You can download the book to your Kindle or iPad here. Just as anybody running for political office needs to have a ready answer to the question, “What are you reading?” anybody spending time in Christian circles needs to be able to reveal, just in case, his or her favorite Bible verse. Being the energetic, works oriented, dirty hands kind of guy I am, I have recently responded to the question with Ephesians 2:10: For we are his handiwork, created in Christ Jesus for the good works that God has prepared in advance, that we should live in them. Never mind that there are 23,262 verses in the Old Testament, 4,084 verses in the deuterocanonical books, and 7,958 verses in the New Testament for a grand total of 35,304 verses in the Catholic Bible. And from that massive inventory, I should choose a favorite? Never mind the problem that division of Sacred Scripture into chapters and verses, although a fairly recent development in the history of Christianity, only seven hundred or so years ago, was done prior to much advanced textual analysis which is of great value in discerning where the logical divisions, the divisions we show in modern English with sentences and paragraphs, most likely were intended and understood, by the ancient writers and their readers and listeners, to be. Never mind the fact that my choice may reflect some personal bias just as selection of stories to report on the evening news may reflect biases of the news organizations. I've never heard anybody claim it as a favorite, but it has become common to hear Leviticus 20:13 quoted in support of a political position. Exodus 31:14, which prescribes a similar punishment for a different offense (death for desecrating the Sabbath), just doesn't seem to carry the same level of importance. And I have already confessed that my selection of Ephesians 2:10 reflected a personal bias in favor of action. Never mind that a lot of verses are considered out of bounds because they are difficult to understand. I had a pastor a few years ago who liked to say that there are no throwaway words in Sacred Scripture. I believe he is right, and, if that is true, there are certainly no throwaway verses in Sacred Scripture. Still, following the example of Mark Twain who said he wasn't bothered about scripture he didn't understand but just worried about the things he did understand, we tend to read right over those verses that are difficult to understand or to reconcile with our pre-conceived theologies. For example, I have often failed to recognize such as, "Amen, amen, I say to you, unless you eat the flesh of the Son of Man and drink his blood, you do not have life within you,” “Do not think that I have come to bring peace upon the earth. I have come to bring not peace but the sword,” and “Otherwise, what will people accomplish by having themselves baptized for the dead? If the dead are not raised at all, then why are they having themselves baptized for them?” We will rarely hear any of these controversial words pulled from context and quoted as favorites! Even Jesus lost followers when He made the flesh and blood claim. 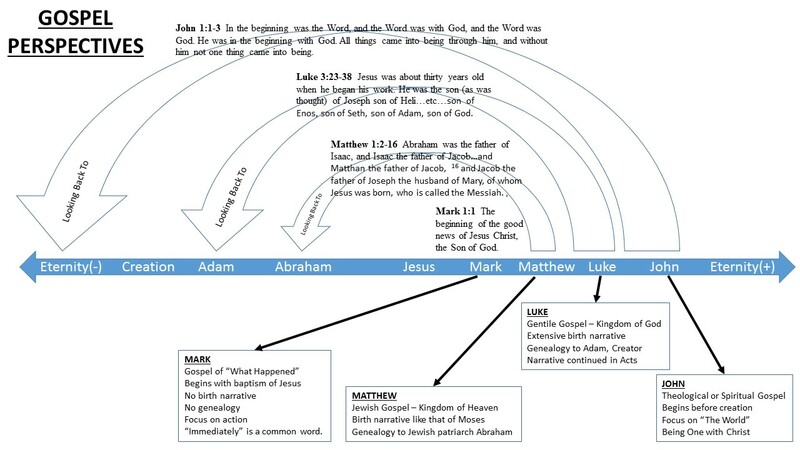 And never mind the fact that context is essential to understanding of the Bible and that picking individual verses out of context can easily result in misleading interpretations and understandings. One reason I am abandoning Ephesians 2:10 as a standalone favorite is that it ignores important context. Immediately preceding it are Ephesians 2:8-9: For by grace you have been saved through faith, and this is not from you; it is the gift of God; it is not from works, so no one may boast. That might be the favorite of a person whose personal theological bias favors the “saved by grace don’t have to do anything” position while my former choice seems to favor “works righteousness,” the idea that we can work our way to eternal salvation. But these verses taken together, seem to destroy both extreme positions. Apparently, grace and works are opposite sides of the same coin. So, when I chose one as my favorite, I really should have preserved some context and kept the two together. Or I could have chosen James 2:17: So also faith of itself, if it does not have works, is dead. Here is another context issue. A popular verse and good candidate for favoritism is Philippians 4:13: “I can do all things through Christ who strengthens me.” (KJV) Those words, yanked out of context, are so affirming that, in a popular culture that treasures affirmations, we may easily forget that they are the words of St. Paul, a man who, when guilty of persecuting the Body of Christ, had been struck blind on the road to Damascus, “caught up to the third heaven,” and assigned the task, by Jesus, of taking the Gospel to the Gentiles. He had followed that charge, suffering much along the way, even some unidentified “thorn in the flesh” which, in spite of Paul begging three times for relief, the Lord had not removed. I think it is safe to say that I ignore context if I stretch the meaning of that verse to support shooting par golf, picking a stock that becomes a “ten-bagger,” running an eight minute mile at age 72, or remembering the Hebrew and Greek I worked so hard for at the seminary. I clearly cannot do all things. As for context in this particular case, St. Paul seems to have been thanking the Philippians for some support they had provided him and telling them not to worry because God was giving him the strength, not to eliminate, but to survive, even with suffering, whatever problems came his way. I should have such faith and patience! My new choice is a verse of worship and adoration of the Triune God who has demonstrated his grace and mercy and steadfast love (That’s a hint.) through Jesus Christ. It is all about God and does not contain any first person pronouns. Its key words are repeated several times in slightly different arrangements in Sacred Scripture, and it expresses a central theme that runs throughout. And the proof of it is affirmed in Jesus’s “True Vine” discourse: John 15:13 No one has greater love than this, to lay down one's life for one's friends. Psalm 145:8 seems to say it all: The LORD is gracious and merciful, slow to anger, and abounding in steadfast love. That is my choice, and I’m sticking to it…at least until I learn more. Exodus 34:6-7 The LORD passed before him, and proclaimed, "The LORD, the LORD, a God merciful and gracious, slow to anger, and abounding in steadfast love and faithfulness, keeping steadfast love for the thousandth generation, forgiving iniquity and transgression and sin, yet by no means clearing the guilty, but visiting the iniquity of the parents upon the children and the children's children, to the third and the fourth generation." Nehemiah 9:17 But you are a God ready to forgive, gracious and merciful, slow to anger and abounding in steadfast love, and you did not forsake them. Psalm 86:5 for you, O Lord, are good and forgiving, abounding in steadfast love to all who call on you. Joel 2:13 Return to the LORD, your God, for he is gracious and merciful, slow to anger, and abounding in steadfast love, and relents from punishing. Jonah 4:2 for I knew that you are a gracious God and merciful, slow to anger, and abounding in steadfast love, and ready to relent from punishing. And this from the Gospel of John about God’s demonstration of His grace, mercy, and love: John 15:13 No one has greater love than this, to lay down one's life for one's friends. 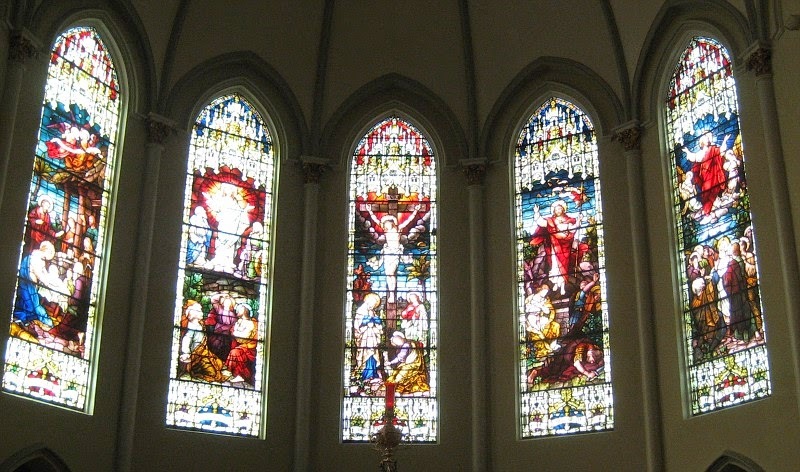 I know the photo is poorly focused, but this is what I was looking at this morning, just four days after left eye cataract surgery, before the 9 a.m. Mass at St. Peter's Catholic Church: beautiful, century old works of art depicting the Birth, Transfiguration, Crucifixion, Resurrection, and Ascension of Jesus. I snuck my iPhone out and hurriedly snapped the picture after marveling at how different the windows looked using only the newly repaired eye rather than both eyes. I thought of doing a blog post. Left eye covered, the windows were beautiful. But, with right eye covered, the colors were markedly brighter, the whites especially whiter, allowing so much more light to enter. (I can only imagine how much better they might look to someone who didn't get his maternal grandfather's color blindness gene, passed along to him by his mother.) I have about six more weeks now for making such comparisons before the scheduled April 1 surgery on the right eye. After that, I may tend to forget how much improvement resulted, so I am writing this blog post at least partly as a permanent reminder. What a wonderfully simple miracle cataract surgery is, performed in my case by an ophthalmologist who, sensing my nervousness about having him cut into my eye, assured me that they have the process down to a fine art and that he has done thousands. I said, IV needle already in my arm, "I am in your hands," and he replied with a big smile, "I pray that God is going to bless you through me." I relaxed. Of course cataract surgery is nothing new. It was first documented more than 400 years before that horrific crucifixion of Christ depicted in the center window above. It was primitive, of course. The "surgeon" would wait until the cataract was hard and completely opaque and brittle and then strike the eye with sufficient force to break up the cataract, the pieces of which would remain in the eyeball but allow some light to enter, providing very limited and unfocused vision. You can read about it here. I'm guessing cataract surgery was not widely practiced until the process used today was invented in 1967 by Dr. Charles Kelman, his incredible story and obituary here. Now, to borrow some words of Hank Williams, Jr., it seems to me that all my rowdy friends are having cataract surgery. I'm guessing that otherwise we would all be slowly going blind and that, in Bible times, blindness of varying degrees was probably as common in old age as skin cancers and forgetfulness are today. Forms of the word show up 47 times in the Gospels, most often in the Gospel of John which proclaims Jesus to be "The Light of the World," an effective cure for spiritual blindness, and which gives us the wonderful story, in Chapter 9, of the healing of the man born blind and the frustrations the Pharisees experienced trying to figure out how that happened and how to convict Jesus of sin for healing on the Sabbath. One of the most well known Bible verses today is the response of the healed man when questioned by the Pharisees: "One thing I do know, that though I was blind, now I see." That single chapter could be developed into a major motion picture, which would probably be a shame. My cataracts are being caught early before significant reduction in vision, but I certainly look forward to and am thankful for the opportunity to stop the deterioration and to see more clearly. Lest I forget the blessing, I will go back and read this post once in a while. Here is a little better picture of the windows. St. Peter's has a process under way to publish a book of professional photos of the windows along with full descriptions and histories of each.